CORE Mechanical received the Winner of Distinction Award at the Better Business Bureau (BBB) Awards for Excellence luncheon held Wednesday, May 7, 2014, at the Westin Galleria. This was CORE Mechanical’s first time to be recognized by the BBB for service excellence. The BBB Awards for Excellence recognizes businesses and non-profits for their achievements and commitment to overall excellence and quality in the workplace. Our entire team at CORE Mechanical is thrilled to have been chosen to receive this award. 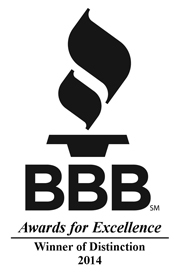 We work hard to ensure that we always go above and beyond to exceed our customer’s expectations, and are honored to be recognized by the Better Business Bureau.